Sitting atop Benthem Crouwel's customs building is this pioneer's hut looking out over the Rotterdam dock area. Fitted with a stove, the house can in principle be appropriated by those of a pioneering disposition. Its front facade has an American-style veranda; the rest is a basic affair with a pitched roof. 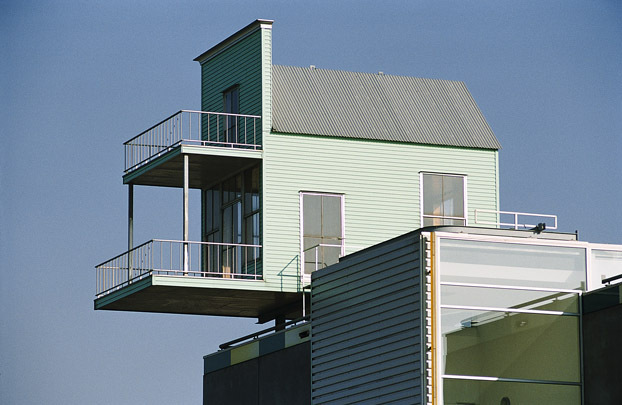 The hut was assembled on site from scraps of PVC by its designer, artist-architect John Körmeling, who had earlier suggested perching a site manager's hut on the roof of Piet Blom's tilted cube houses north of the river.